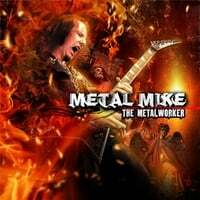 This is the complete collection from Mike's solo output. This super bundle will take you on a metal odyssey of the very early Grind Textural Abstraction CD all the way to the latest riff meltdown of The Metalworker. All CDs come nicely signed by Mike in a silver pen. The early Cds are in limited supply and will never be reprinted in the original form, so grab them all at this incredible price. If you want the CDs personalized, please give us the name on the Notes To Seller tab in your Pay Pal check-out cart.